On the Sunday after Thanksgiving, the Menlo Park Farmers’ Market was both taking a pause — quite a few regular vendors were missing — as well as heralding the coming winter and Christmas season. Cozzolino Farms was present, but instead of flowers, the newest member of the family, Stephanie (she married Tony this past April), had brought wreaths to sell. “Tony is in charge of the pumpkins and the Christmas trees, which we will have here at the market next week,” she said. 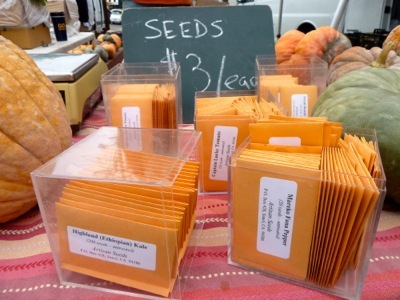 At the other end of the market, Fred Hempel, owner of Baia Nicchia Farm, was selling one of the farm’s newest products, seeds. “We formed a joint-venture seed company, Artisan Seeds, and have five unique varieties that either we bred or were bred by other small farmers,” he explained. “The Highland kale is ready to plant right now, and the seeds cost just $3 here in Menlo versus $3.95 online.” Three kinds of tomato seeds were also available — Captain Lucky, Purple Bumble Bee, and Pink Bumble Bee — as well as Mareko Fana, described as a purple-brown pepper that is the foundation of many Ethipian dishes. Because a he’d gotten a number of requests today, Fred asked us to let people know that he will have Highland Mustard at the market next week.